All transactions are safe and secure with a reliable history in online purchasing behind each of our associates. 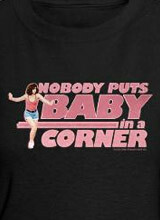 Buy the Baby in the Corner Dirty Dancing t-shirt to own Dirty Dancing clothing and merchandise. Many scenes in this movie may make your heart flutter but few are as exhilarating as Johnny Castle jumping off the stage and dancing down the aisle to the song "The Time of My Life". This Patrick Swayze shirt highlights his quote along with a picture of Baby practicing for this moment. If you think you have some hot moves too and want to give it a try yourself, the song is featured on the Dirty Dancing soundtrack available in the gallery. Listen to it as you read Patrick Swayze's book, The Time of My Life. The Crazy for Swayze t-shirt below may also be of interest to true fans. In addition to the Baby in the Corner Dirty Dancing tee above, browse the Dirty Dancing Clothing Gallery for more apparel like men's and women's clothes, kids shirts or hoodies.